We're loving this new red from dry farmed vineyards in Chile's Maule Valley! Find full details on this awesome Syrah / Cabernet Sauvignon blend below. Chile is something of a winemaking utopia. Its wine regions enjoy an unique isolation from the rest of South America. Lying to the East, the Andes Mountain Range. To the North, The Atacama Desert. To the South, Antarctica. To the West, the Pacific Ocean. These natural boundaries have protected Chile from the scourge of phylloxera, a homicidal bug lethal to vine roots. The Humboldt Current moderates the climate, ensuring warm days and cool nights, ideal for grape growing. The Central Valley, home to the capital of Santiago, is where the majority of Chilean wine is made. The valleys of Maipo, Colchagua and Maule Valley have well earned international reputations. The Gillmore estate is situated in the Loncomilla Valley in the coastal dry area of the Maule Valley. The terraced vineyards, made up of alluvial clay soils and deep granitic colluvial rocks, allow for deep root systems and concentrated fruit. The French had a lasting impact on Chilean winemaking, and it is their grape varieties that have flourished here. In fact Chile makes more Cab Sauv than the US. Syrah as well has made a mark in Chile, known for excellent minerality and age-worthiness. Many of Chile’s wines are priced to sell and offer great value. The Gillmore Mariposa Red Blend is comprised of 50% Syrah and 50% Merlot from low yield, dry-farmed, 50 year-old organic estate vines. Fermentation is done in stainless steel, and matured in second use barrels for 12 months. Over 55% of Chile’s wine production is controlled by only seven major producers. Small wineries like Gillmore are the exception. Founded in 1990 by Fransisco Gillmore, it is now managed by his daughter Daniella Gillmore and her husband, winemaker Andrés Sanchez. When Francisco bought the century old Tabontinaja winery, it’s old vines were planted to the rustic País variety. Rather than pulling these fantastic vines, he grafted international varieties to their root stocks. All of their farming is done by hand and without irrigation. To protect this special place, Francisco helped found MOVI and VIGNO, guilds that protect the land and traditions of the Maule Valley. Chile has been a bit overshadowed by its neighbours from Argentina in recent years, but is making a strong comeback with handcrafted, small production wines like this one! Chilean wine is sometimes described as being somewhere between France and California. 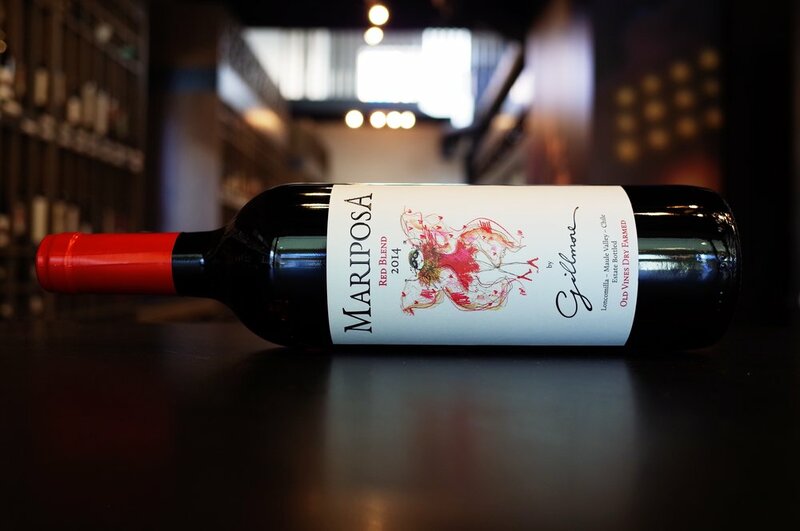 The Mariposa balances Merlots ripe plum and black cherry notes with Syrahs supple meatiness and spice. Medium bodied, it is has a refreshing dash of acidity and svelte tannins. This is a wine of place, favouring freshness over bombast. Enjoy with a simple charcuterie board, or simply on its own. Sign up with your email address to receive our Vine Arts Monthly Propaganda newsletter.